VIA is seeking a mid-level Transit Architect for our growing San Francisco office. VIA Architecture is a multi-disciplinary architectural and planning firm of urban strategists creating connected communities. With offices originally in Vancouver and Seattle, we’re now bringing our ability to craft thriving urban places centered around transit and integrative development to San Francisco. Highly networked across three offices, ours is a highly interactive studio based practice concentrated in urban planning, transit systems planning and design and architecture for urban mixed-use development. Our systems-level sustainable design strategies and community-based design studio set us apart from traditional architectural practice. About this position This is your opportunity to make an impact as part of our start-up here in San Francisco while benefiting from the deep intellectual capital, technical resources, and hands-on work-style of a capable mid-size firm. We see this position as a growth opportunity for you to learn the “VIA way” to manage and design transit facilities while moving into increasing project management responsibilities. Participation as team member in conceptual design through construction documentation with an emphasis on leading consultant and/or in-house design and documentation teams in conjunction with the Project Manager and Project Designer. The dilemma is that although the City of Vancouver and its residents have, in most part, adopted the principles of mobility and growth, the other municipalities of the region have been formulating the right balance of growth and livability. What is often forgotten is that by densifying the areas near transit, the pressure for growth in existing single family neighbourhoods is lessened. Vancouver is often associated with images of high rise towers but in fact 80% ‎of the City’s residential land area is occupied by single ‎family homes. The regional cities are wrestling with what it means to be more urban, what the appropriate and authentic form and character should be for their cities, and what the ingredients and the necessary components are to make their cities work successfully. For these suburban communities to move to a more urban model, it means that residents and businesses are asked to reconsider a vision for growth and livability that is significantly different to the norms that have defined suburban life for six decades: the automobile and the single family home. Vancouver – leading the way in Canadian cities’ transit infrastructure expansion VIA Architecture was recently invited by CBC-TV to provide comment on the Pembina Institute’s study of transit system in Canada’s major cities. The study highlighted that Vancouver has built the most kilometres of rapid transit over the last 3 decades. But whereas Toronto and Montreal’s 40 year old transit lines provide service within 1 kilometer of more than 30% of the population, less than 20% of Vancouver’s population has the same connectivity. Entering a Municipal election cycle where provincially controlled transportation funding is a key issue, this provided fodder for knee jerk blogging about bloated transit funding not serving the needs of the majority. Fortunately, in conjunction with our discussions, CBC went deeper into the analysis than that. The Pembina authors had pointed out that in comparing the Cities they used the Metro Vancouver average data to match the scale of regional completeness of Montreal, Toronto, Calgary and Edmonton’s civic borders. 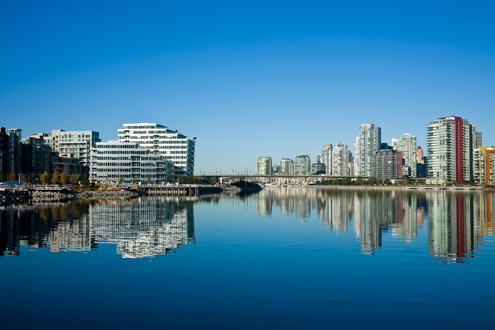 Approximately 640,000 of Metro Vancouver’s 2.4 million population live in the City of Vancouver. Using Pembina’s index of transit proximity, 54% of Vancouverites live within the rapid transit walk-shed, but less than 13% of those in the other 20 municipalities do. 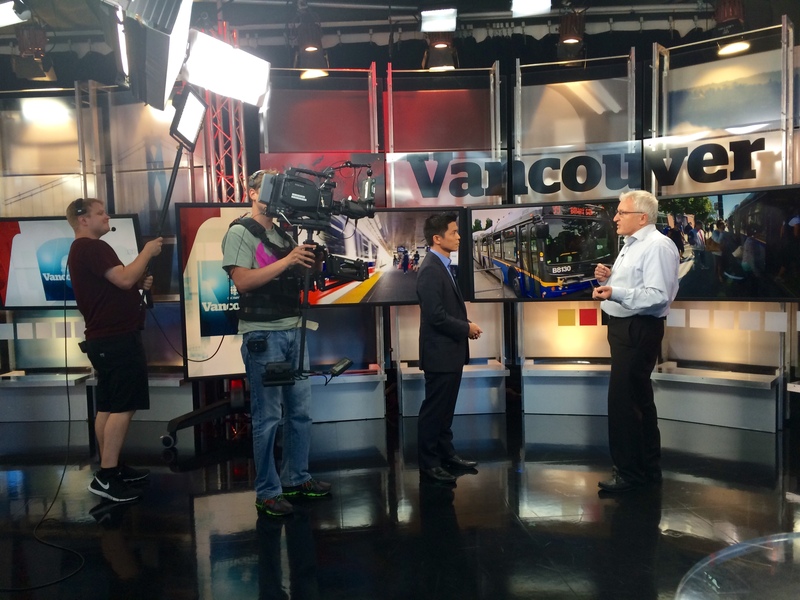 Sept 5: Graham McGarva’s interview with Andrew Chang, anchor of CBC Vancouver’s evening news. Full build-out of the Rainier Beach light-rail station area would create a balance of businesses and housing. Of course the catch is that there’s no easy formula for bringing high-quality jobs to desired locations. Do innovation districts just happen, or can the public sector help them along? VIA recently engaged in two employment-based planning efforts that illustrate concepts and approaches, as described below. PalleTopia design as set in Surrey Centre’s Landscape. VIA Architecture is proud to have participated in the City of Surrey’s 2014 PARKit Design Challenge. 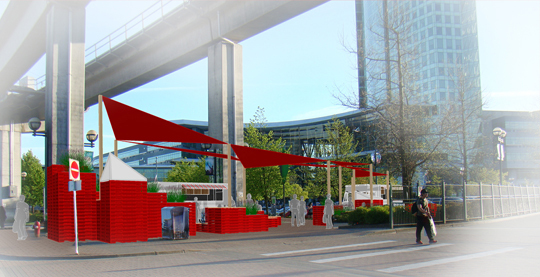 A team of VIA designers presented ‘PalleTopia’, a design to use stacked reusable pallets as modules to create a playful and multi-functional space right next to the entrance of Surrey Central Station. This endeavour was part of a public call for the design and installation of a $15,000 summer season pop-up park. PalleTopia, designed by Zhaleh Moulaei, Sophie Steer and Brendan Hurley was granted Honourable Mention amongst all of the submissions received by the City. Exercises carried out within the VIA Office in Vancouver helped develop a vision for the mini-parkit as a simultaneous node, stage and gateway to create a place that comfortably and elegantly connects the people of Surrey with their urban centre and to each other. A new axis for Surrey’s growing centre. There’s a new type of space coming to Seattle – it’s tiny, but packed within its small stature are all kinds of good qualities. Residents are reclaiming the public right-of-way (i.e. roadway), traditionally taken-up by parked cars, for open and green space. It’s called a parklet and like the name suggests, the easiest way to describe them is as “mini open space.” And yet that term just doesn’t quite capture the breadth and beauty of these little spaces because they’re so much more than a plaza or patch of green space. Read the full article on CapitolHillSeattle.com by clicking here If you want to learn more about Seattle’s pilot program or get involved in one of the 13 parklets already being planned, consider checking out SDOT’s project website. And remember, these little parklets are being funded completely by our communities, businesses, and neighborhood organizations so if you’re short on time but still want to support the mission of these little gems, you can always help by donating! If you’d like to contribute to the 25th & Union Parklet, you can do so at this parklet’s online Crowdrise campaign. On Sunday May 4th, planners and architects from VIA kicked off the 2014 Jane’s Walk with a twist: our “walk” included transit, which is an integral part of the history and future of development in Vancouver. Our 2.5-hour-long urban exploration covered more than 44 km (27.5 mi) of Vancouver’s urban development context and history by including a ride on the SkyTrain. The intent of the Jane’s Walk is to celebrate the life and works of urban thinker and activist Jane Jacobs by presenting free community tours that examine elements of what makes a city work. Our tour focused on building and enhancing walkable, connected communities by viewing transit as an extension of being a pedestrian. It revolved around the past, present, and future of transit-defined visions of the Vancouver region and its neighbourhoods. The tour covered a lot of ground AND track, but followed the historic path of transit in Vancouver. We started on the Expo Line, the oldest line of the SkyTrain rapid transit system, where portions of it followed the path of the Central Park Interurban Line that ran from 1890 until the 1950s, connecting downtown Vancouver with New Westminster. In some places, evidence of the system of 120 years ago is still exposed below the pillars of SkyTrain. The modern system is a dream of a region-connecting “people mover”—part of the legacy of the 1986 World Exposition. As part of Take Our Daughters and Sons to Work Day, VIA opened the office to young people ages 8 to 18 who wanted to learn more about architecture and planning. Caltrans: Soon to be Complete Streets-in-Chief? At the start of 2014, the sharp criticisms of one state agency against another made California planning headlines. The State Smart Transportation Committee (SSTI), in a report to the legislature, called out Caltrans as “archaic,” incapable of adapting to a changing transportation environment, and lacking resources needed to lead in the modern, post-Interstate building era. The report enumerated the problem with a Caltrans which is at direct odds with other statewide agendas to promote smart growth, sustainability, and reduced GHG emissions through SB 375. A culture change is in order. Taking the report at face value and diving into the wake it opened up, Caltrans’ Director, Malcolm Dougherty, together with the Leadership of Transportation Secretary, Brian Kelly, is leading a swift response. A new mission statement published in February redirects the agency from that of “master builder” of roads and highways to an emphasis on its role as a partner within the context of an integrated and mature transportation system. The intention is to allow for better collaboration with “self-help” counties who bring a large share of local dollars to the table for infrastructure projects, as well as a major policy realignment toward all forms of transport, that brings the department up to date. In the end, perhaps it might look more like San Francisco’s SFMTA Department of Sustainable Streets, as statewide Complete Streets in chief. Graham McGarva, Founding Principal of VIA Architecture, will be speaking at Cascadia Cities: Then + Now which is presented in conjunction with the Urban Land Institute’s The Cascadia Experience: Behind the Emerald Curtain event, exploring the unique market drivers that shape the cities of Seattle, Portland, and Vancouver. The lunch program takes place Tuesday, 08 April 2014, from 12:30 – 2 pm at the Grand Hyatt in Seattle, WA. Graham will be presenting the Vancouver perspective, alongside a panel that includes former Mayor of Seattle Norm Rice, and Scott Andrews of Melvin Mark in Portland. His presentation will include a recount of the history of Vancouver, the successes it has seen along the way—including the advent of the pencil tower, the planning and development of the False Creek area, and growth of regional transit—as well as current issues, and what the city faces in the future.